The most proactive step you can take to prevent flooding at your cottage is to clear and relocate accumulated snow from around your cottage. The closer the snow is to your property, the more potential damage it’s going to be able to do to your cottage. Moving snow away from your foundation and ground-level windows and doors will work to prevent it from being able to seep into your cottage. Moving the snow around 5 feet away from your foundation usually does the trick, letting it melt safely away from your cottage and saving you a lot of frustration down the line. Once the snow has been cleared from around your cottage and its ground-level windows and doors, you can start to inspect your property for any damages, leaks, or points of weakness that may lead to leaks in the future. Checking for leaks and damage will let you be proactive in getting them sealed and repaired, preventing flooding during this year’s melt as well as further damages in future spring seasons. This is also a great opportunity to look into installing window well covers for ground-level windows, which will prevent snow melt from leaking into your window wells while at the same time allowing in plenty of natural light. A damaged or old roof can spell disaster for your Muskoka cottage, so it’s important to inspect it for damages and leaks early in order to plan for repairs or maintenance. The weight of a season’s worth of snow can do a lot of damage to your roof, with older roofs being especially vulnerable. A leaky roof can let in a great deal of water, increasing your chances of flooding and damage. It’s a good idea to leave this task to a professional home inspector or roofer, who will be able to properly assess potential damages and give you a good idea about what needs to be done in terms of maintenance. Inspecting your roof also gives you the opportunity to inspect and clean your gutters and spouts, which can quickly lead to flooding if they’re backed up or damaged. Ensure that your cottage’s gutters are clean and free of damage in order to allow snow and water to safely and freely move away from your property. 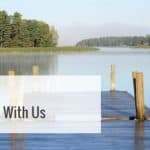 If you’re concerned about future flooding in your Muskoka cottage, installing a sump pump is a proactive measure you can take to minimize your flooding risk. A sump pump works to automatically move any excess water away from the foundation of your home or cottage, instead diverting it safely to the outside of your property. Sump pumps are especially useful for cottages with a basement below the water table level, and those situated near bodies of water. Be aware that sump pumps require regular maintenance and testing in order to be truly effective, so installing one will mean regular upkeep. Portable pumps also exist for those who aren’t looking to have a permanent sump pump installed in their cottage, but their mileage may vary. For more information about Muskoka Window & Door Centre’s high quality line of window and door products, visit our website or contact us today.